For trustworthy, reliable and affordable GPS tracked leaflet distribution in Surrey, Abracadabra Leaflet Distribution can help you to reach the pinnacle with your leaflet distribution campaign. We understand how daunting it is for any business to understand and tap into their target market which is why we want to make it a simple and seamless experience for you. For this reason, we offer a free one-to-one consultation which gives you the unique chance to speak to one of our in-house marketing experts. After all, we want your campaign to be as successful as possible because the more successful you are, the more successful we are! We offer a bespoke mapping solution to tap into the potential target market in the most cost-effective way and, for the best possible return on your investment, we can offer a customised design, print and distribution package. With a repeat rate of approximately 80% you can’t go wrong with our complete service and we take pride in following the code of practice as laid out by the Leaflet Distribution Organisation (LDO). But don’t just take our word for it – see what our clients have to say about us by visiting our testimonials page! As the saying goes ‘the best things in life are free’, so let’s start by telling you a host of FREE services and other benefits we can provide for your leaflet distribution campaign. FREE report on your GPS tracked flyer delivery, so you can view the exact route the flyer delivery person took to deliver your leaflets, as seen in the above image. FREE consultation over the phone or in person for your leaflet distribution campaign. FREE impartial advice is provided on the best possible way to plan your promotion. You can save more with our special Design, Print and Distribution packages. You can choose any quantity between 1,000 to 500,000 and it can be distributed by our efficient GPS tracked flyer delivery staff. We offer guaranteed services between 1 day – 14 days for your time sensitive direct marketing campaign. FREE report of the actual household numbers for a town so you will know how many leaflets to be printed. FREE region specific demographic information regarding ownership, as seen in the image below. Solus– Your leaflet gets a premium service and is delivered just by itself. 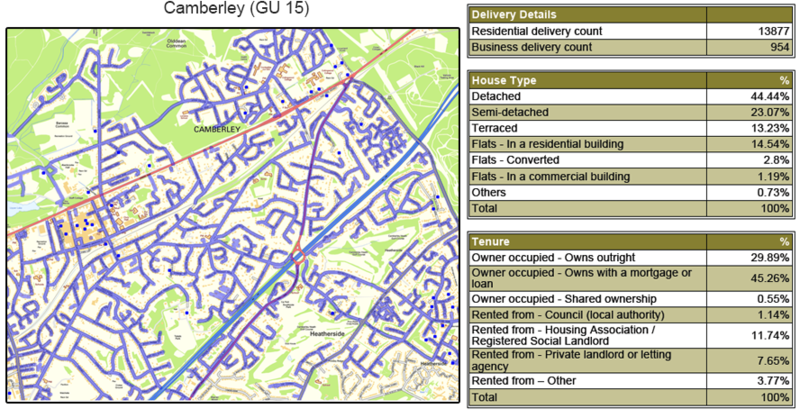 Abracadabra Leaflet distribution offers leaflet distribution in Surrey to all the main towns including Camberley, Farnham, Frimley, Godalming, Lightwater, Bagshot, West End, Windlesham, Bisley and Chobham. Surrey is an affluent county with a service based economy closely tied to that of London. Surrey has more organisation and company headquarters than any other county in the UK. Promote your business in this county through Abracadabra Leaflet distribution and benefit from our exclusive Leaflet Printing and Distribution package in Surrey.